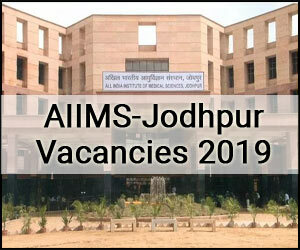 New Delhi: All India Institute of Medical Sciences, Jodhpur (AIIMS Jodhpur) recently released 139 vacancies for various faculty positions on Direct Recruitment/Deputation/Retired Faculty on Contractual Basis. It has invited online applications for the posts of Professor, Additional Professor, Assistant Professor, and Associate Professor. Last Date to Apply: 05-04-2019. The last date of online submission of applications will be Thirtieth Day (30th Day) from the date of publication of advertisement in Employment News/ Rojgar Samachar. Subject: RECRUITMENT OF FACULTY POSTS (GROUP ‘A’) IN VARIOUS DEPARTMENTS OF AIIMS JODHPUR ON DIRECT RECRUITMENT / DEPUTATION / RETIRED FACULTY ON CONTRACT BASIS. Online applications are invited from Indian Nationals and OCI Cardholders (Overseas Citizen of India) for the following faculty posts on DIRECT RECRUITMENT/ DEPUTATION/ RETIRED FACULTY ON CONTRACT BASIS IN VARIOUS DEPARTMENTS of All India Institute of Medical Sciences, Jodhpur (Rajasthan). The Vacancies are in the Department of Anaesthesiology & Critical Care, Anatomy, Biochemistry, Burns & Plastic Surgery, Cardiology, Cardiothoracic Surgery, Community & Family Medicine, Dentistry, Dermatology, Venereology and Leprology, Diagnostic and Interventional Radiology, E.N.T.-Otorhinolaryngology, Endocrinology & Metabolism, Forensic Medicine & Toxicology, Gastroenterology, General Medicine, General Surgery, Hospital Administration, Medical Oncology/ Haematology, Microbiology, Neonatology, Nephrology, Neurology, Neurosurgery, Nuclear Medicine, Obstetrics & Gynaecology, Orthopaedics, Paediatric Surgery, Paediatrics, Pathology, Pharmacology, Physical Medicine & Rehabilitation, Physiology, Psychiatry, Pulmonary Medicine, Radiotherapy, Surgical Gastroenterology, Surgical Oncology, Transfusion Medicine & Blood Bank, Urology, #Trauma & Emergency, Nursing. Professor– A medical qualification included in the I or II schedule or part II of the third schedule to the Indian medical council Act of 1956 (Persons possessing qualifications included in part II of third schedule should also fulfill the condition specified in section 13(3) of the Act.)2. A post graduate qualification e.g. MD/MS or a recognized qualification equivalent thereto in the respective discipline/subject. Additional Professor– A medical qualification included in the I or II schedule or part II of the third schedule to the Indian medical council Act of 1956(Persons possessing qualifications included in part II of third schedule should also fulfill the condition specified in section 13(3) of the Act.)2. A post graduate qualification e.g. MD/MS or a recognized qualification equivalent thereto in the respective discipline/subject. Associate Professor– A medical qualification included in the I or II schedule or part II of the third schedule to the Indian medical council Act of 1956(Persons possessing qualifications included in part II of third schedule should also fulfill the condition specified in section 13(3) of the Act.)2. A post graduate qualification e.g. MD/MS or a recognized qualification equivalent thereto in the respective discipline/subject. Assistant Professor– A medical qualification included in the I or II schedule or part II of the third schedule to the Indian medical council Act of 1956(Persons possessing qualifications included in part II of third schedule should also fulfill the condition specified in section 13(3) of the Act.)2. A post graduate qualification e.g. MD/MS or a recognized qualification equivalent thereto in the respective discipline/subject. • Professor: Entry Level Pay Matrix 14A (Basic 1,68,900) and all usual allowance (Plus NPA for medically qualified candidates only). • Additional Professor: Entry Level Pay Matrix 13-A2+(Basic 1,48,200) and all usual allowance (Plus NPA for medically qualified candidates only). • Associate Professor: Entry Level Pay Matrix 13-A1+(Basic 1,38,300) and all usual allowance (Plus NPA for medically qualified candidates only). • Assistant Professor: Entry Level Pay Matrix 12 (Basic 1,01,500) and all usual allowance (Plus NPA for medically qualified candidates only) After three years, Assistant Professors will move to level 13 (Basic 1,23,100) of the Pay Matrix. Professor/Additional Professor:- Not exceeding 58 (Fifty Eight) years as on closing date. Associate Professor/ Assistant Professor:- Not exceeding 50 (Fifty) years as on closing date. (i) Upper age limit shall be determined as on last date of submission of online applications. (ii) No age relaxation would be available to SC/ST/OBC/PwBD Candidates applying for unreserved vacancies. 1) General (UR)/ OBC /EWS Candidates:- Rs.3,000/- (Rupees Three Thousand Only). 2) SC/ST Candidates – Rs.1,000/- (Rupees One Thousand Only). 3) *Women’s – Rs.200/- (Rupees Two Hundred Only). 4) *Persons with Benchmark Disabilities – Rs.200/- (Rupees Two Hundred Only). 5) The candidate pay prescribed application fees through Online Mode Only via payment gateway of AIIMS, Jodhpur. Transaction/ Processing fee, if any, as applicable will be payable to the bank by the candidate. 6) Application fee once remitted shall not be refunded under any circumstances. 7) Applications without the prescribed fee would not be considered and summarily rejected. Note:- * This fee of Rs. 200/- (Rupees Two Hundred Only) shall be refunded duly deducting Bank Charges as applicable, on appearing of the candidate in the Interview. 1. The initial period of deputation shall be 5 years further extendable for another 02 years. 2. The deputation will be governed by the standard terms and conditions of deputation provided under Department of Personnel & Training Vide OMs No. 6/8/2009-Estt. (Pay-II) dated 17th June, 2010, OM No. : 2/6/2016-Estt. (Pay-II) dated 17th February, 2016 and OM No.2/6/2016- Estt. (Pay-II) dated 23rd February, 2017, as amended from time to time. @Dr. Arul.. I am not agree with it. AIIMS always prefer professionals who are passed out from institutes be it PGI, AIIMS, KGMC, CMC, JIPMER etc. If one belongs to any such Institute s/he will have fair chances to get selected. Don\’t waste time to apply my friends, all posts are reserved for Ex AIIMS students, remaining post will be declared as no suitable candidate found and given to retired faculties of AIIMS. This entire process is an eye wash and reflects the corrupted nature of central appointments.